emPerform UK is ideal for medium to large businesses looking to streamline their appraisal and talent management process. emPerform is the only non-modularised talent management solution available that offers powerful online appraisals, goal management, and 360 reviews enhanced by a suite of best-practice performance management features to help you simplify reviews and create a winning talent management strategy. emPerform has thousands of users across the globe spanning large and small organisations in both the public and private sectors. emPerform UK Reviews Recently Reviewed! Pros: From an administrative perspective, I like how elegant and easy the system is to use. I appreciate being able to design new forms and evaluation workflows myself (the well designed system makes me feel so smart, it's that user friendly! ), knowing too that if I get stuck a clear and informative tutorial, as well as fabulous tech support are immediately accessible. I like that the emPerform technology is seamlessly supporting important conversations between our managers and their direct reports. Instead of being overwhelmed and bogged down with the forms as they used to be, our managers are freed up to focus their attention on our employees rather than struggling with the forms. This is, of course, invaluable for us. Overall: Our organization has enjoyed a terrific collaborative experience with the emPerform performance management system, and the entire emPerform support team, from our first point of contact, through the initial implementation, continuing through our ongoing use of the system, and our enjoyable (and I do mean that enjoyable, every time!) correspondence with the emPerform team for support, training, upgrades, etc. From day one, the software has been of extremely high value to us both the product and the service provided by emPerform has been above and beyond all of our (high!) expectations. It's just a great product and a great team to be involved with. We couldn't ask for more. Pros: Very easy to use - point, click, type, save, submit! As the administrator, I like the ease of building new forms and surveys. Super easy compared to other systems. Cons: The ratings are averaged and I wish we had the option to sum the ratings. Pros: I like the look and feel of the product. Very professional when you put the tool together with your company's logo and colors. Pretty intuitive from a non-admin perspective. My managers seemed to like it. Cons: From an admin perspective, it is a little cumbersome and often overwhelming. Need a step by step administrative user guide. Overall: Overall our experience with emPerform has been terrific! Our newly assigned consultant didn't miss a beat with us and offered up many suggestions that helped streamline our processes even more! Pros: This system is very user friendly and easy to understand and has allowed us to incorporate all of the facets of our performance management system along with the salary review component. This has increased the efficiency of administering this process on an annual basis as well as helps our Supervisors and Managers maintain feedback throughout the year. From a user standpoint, it does not require much training to learn the process. From an administrator standpoint, I like the flexibility that the system offers in terms of changing layouts, formats, etc. I also like the notifications that are automatically sent to users as this has decreased the time it takes to administer our performance evaluation process. Cons: The evaluation reports are VERY confusing to read. Even when exporting to PDF or Word, the formatting is done is such a way that is almost impossible to make more reader friendly. I would like to see improvements made in this area, as it is necessary from time to time to print a report. Comments: I was just recently introduced by emPerform while recently entering into a new position, and like many other companies we were using the method of handing a print off to an employee and asking them to complete their own evaluation. Which this method is fine as long as there is open dialect between Manager and employee, but at times we all get busy and lose sight of this process. This was my first experience using and performance management system, and first impression is that I was very impressed. 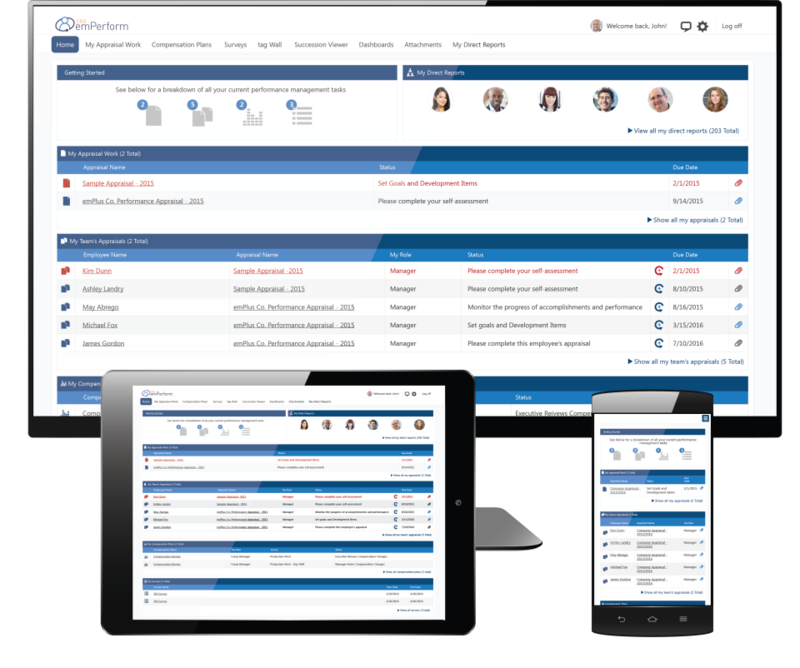 The fact that this system will help initiate the open communication between Manager and employee and to hold all parties involved engaged and accountable for their part in the process. I also love the fact that you will have access to past evaluations to reflect on what you have done in the past and that all the information will be available and accessible at your leisure. I cannot say enough about the level of customer service that was offered from emPerform's staff and level of professionalism, we had an awesome trainer and facilitator by the name of Kris Kyritzopolous. During and after the implementation Kris was always accessible and very responsive, and just executed the level of customer service, that was very refreshing. I would highly recommend this product to any corporation looking to effective promote their performance management process. Cons: Nothing really, just learning the system from an administrative standpoint. Overall: The journaling and tagging features in emPerform support our ongoing performance review process. The improved user interface that was rolled out in January 2016 is a big improvement over the previous version. One of their greatest strengths is their very helpful customer service team and account managers - always responsive and thorough. However, the system is still clunky, particularly on the admin side, and administrators and users alike continue to have difficulty even logging in. The system could use a bit of a technology update as well, incorporating more features and allowing for hyperlinks and more individualization. Pros: How customizable it is. We can set it up how based off of what we need and can make the workflow super easy and user friendly. The support we've received along the way has also been incredible! It seems to be a one stop shop for us in terms of performance management for our entire organization. Cons: While it has a ton of reporting capability, it is a bit difficult to find what you need at times and drill down into the reporting and data. Cons: Email notifications aren't working very well right now. Other than that I can think of anything else. Comments: With well earned respect, I confidently recommend emPerform for future talent management projects. Looking to breathe some life into our employee evaluation process. I had the good fortune of working with CRG emPerform on the renovation of our Talent Management Initiative. It stood out as one of the most complex projects undertaken by our organization. The success of this complex project depended in large measure on the CRG emPerform team assembled and their ability to communicate and work collaboratively with us towards the goal of an easy-to-use online process. CRG emPerform delivered an all-inclusive functionality that effectively automated and streamlined our employee appraisals. CRG emPerform `s service to NTS was and is excellent. Again, I highly recommend them and would welcome their contribution to future talent management projects. Wow! Thank you for that great review Angelo! It has been a pleasure working with you to automate and streamline vital performance management processes. Be sure to keep in touch as your processes and needs change so we can ensure you are always getting the most from the features included with emPerform. Pros: The system is pretty much adaptable to anything you want it to be. You can easily add or delete sections from one review to another or copy the previous review and make it the next review. Our managers like the system, even though they don't like doing reviews, but they are happy with the ease of use. Cons: The workflow set up is challenging and emPerform staff assistance. Recommendations to other buyers: Make sure you know what you want your system to do for you. Comments: The thing about emPeform is that you can customize pretty much anything. The hard part about it is that its not easy to learn or train on it, but once you start figuring out the features it becomes amazing. Our review system here is not an easy one, but were able to put in a workflow that makes it easy for managers and employees to complete while capturing all the information that we needed. Hi Christina - thank you for your review of emPerform! We love your feedback and you captured one of our biggest points of pride - configurability. We have yet to meet two companies with the same needs so it's important to us that emPerform works for our customers instead of the other way around. So glad emPerform is doing just that for you. We are always working to make training and ramp-up easier and you said it best "once you start figuring out the features it becomes amazing." We have launched some exciting new training programs and resources and will be in touch to discuss. Thanks again for your review and be sure to keep in touch - we are always here to help! Comments: We have used the CRG emPerform software since 2014 -- everything about the process, from the introduction to the company, the decision to implement, the onsite consultation and build of the system for our company, user training and the ongoing user experience has been top quality, easy and very timely. The software is user friendly...intuitive and simple to use for end users as well as for the administrators. The reporting feature is very robust and helpful. In sum, very satisfied with this software and the experience of working with CRG emPerform overall - highly recommend. Comments: We chose emPerform because of it's ease of use, it met our immediate needs and had a reasonable price point. The implementation team was excellent, they worked very closely with my team and provided the support we needed to get our performance system up and running. During upgrades the emPerform team was available to answer any questions my team had and prepared my team for what was to come. We have made suggestions for enhancing the system know that emPerform is building additional capabilities. I look forward to seeing the tool meet even more of our needs. Comments: As above stated based on my rating it's good. However it doesn't give details about upgrades. Every time there's an upgrade we spend a great amount of time waiting for the issues to be fixed. The most current upgrade we waited about a week. There were technical issues on the back end that couldn't be explain. We usually have to get a test profile to go through the steps when there are major upgrades so we can catch these issues ahead of time. Yes customer support is great during this time but the software itself definitely has issues each upgrade occurs. Hi Mia - I am so sorry to hear the upgrade process didn't go smoothly for you. I can assure you this isn't the norm for emPerform. I know we have already been in touch throughout the process but we will reach out again outside of Capterra to discuss further. Your satisfaction is our #1 priority. Comments: EmPerform is very complicated to use from an administrative standpoint. I've been working with the system for soon 2 years, and I'm still getting confused and frustrated when I need to design a new appraisal or change something in a current appraisal (and I consider myself very computer savvy). Customer Service is not included, so they bill us every time I need to call or email for support (which is quite frequently). Our employees do like the system, and it looks good once it's up and running. It's a nice and functional performance management tool from an employee standpoint, however the headache to set it up and lack of support is not worth the end result. emPerform looks okay at first glance, but it is actually very glitchy and non-functional. Pros: I like the look of emPerform. They were able to customize the homepage with our company logo and colors. Cons: - The software has a lot of glitches. Performance reviews get "stuck" in different stages and the admin has to move the review along. This causes some approvals to get deleted and the process has to restart. - The interface is very limited and staff doesn't really use it throughout the year, only during review time. - Customer service is in Candada and they are hard to reach. We are very sorry to hear that Sabine and can assure you that your satisfaction is our top priority. Someone will be reaching out immediately to discuss and assist. We can adjust your workflow so that the review automatically progresses and you will not experience it being 'stuck'. As for support, we are again sorry to hear that you find our support team difficult to reach as we are in Canada. Support is always included for emPerform customers and is available live during eastern business hours. We do pride ourselves on our fast and diligent responses. We are not able to change how your users approach performance management but again, we will reach out to see if there is anything we can adjust with your emPerform to help. Comments: Very user-friendly for the staff. I love that I can access everything in one place and track goals throughout the year. I've had a little trouble with the admin part in that it is not straight forward and little difficult to navigate and remember the process from year to year, however, the customer support has been wonderful. It would be nicer if it was included in the price of the software, though. I like the new look of 5.0 as well. Very professional. Thank you Debbie! We are extremely happy with the new look of emPerform too. You will be happy to note that support is now included as part of your subscription license fee so call us anything you would like a refresher or some help. Pros: emPerform 4.0 has great functionality built into the system. First, is anniversary based performance reviews. We like the reminder/task list reminder features. It is a comprehensive package including compensation manager, succession manager, reviews and a survey tool. Cons: Cons would be limitations in a system for example not everything can be on one page, you might have to click on a heading to enter the next area. Training on navigation is very important. Overall: emPerform 4.0 fits in very well with our organization and we've been online with reviews for over three years. CRG offers excellent customer service! Pros: Emperform is an excellent performance management tool and the support that I received for my implementation and roll-out from the Corporate Renaissance Group exceeded my expectations. Lonnie Dowdell and Anant Rege provided all of the support that I needed to ensure that I truly felt comfortable with the system. Cons: Not applicable - it is an excellent tool and the Corporate Renaissance Group`s customer service was outstanding. Recommendations to other buyers: Our RFP process was quite robust and the emPerform performance management software met all of our criteria. Lonnie Dowdell was an expert in the system and was able to help me set-up the system to meet all of the needs of our organization. I was truly impressed by the level of service and the quality of the product. Comments: CRG emPerform software is very easy to use -- we've used the software for 2 years and consistently receive positive feedback from end users -- all report very simple to access, intuitive and easy. From an administrator perspective, the customer service is stellar -- we receive very timely and thorough support. The CRG emPerform team is responsive, knowledgeable and very friendly. For organizations seeking a comprehensive system for performance appraisals, goal setting, compensation management. succession planning (and more) -- highly recommend considering and implementing CRG emPerform software. Cons: Initial setup is complicated. Overall: We've used emPerform for 3 years now. The software is very reliable and the single sign makes it a great value to our organization. It is complicated to setup initially but customer support has been excellent. Once the reviews, approvals, etc. are setup, the next year's review creation is much easier. Pros: It allows multiple parties to post their reviews. It also keeps documentation and keeps a timeline for the review team. Cons: Not sure if it's our HR department or it's the software. We were very confused about the process. I am the 1st reviewer and my boss is 2nd reviewer. We often get reminder emails with obscure subject and length text. Sometimes we ignored them. Please keep reminder email short and concise. Overall: Keep staff review process documented. Comments: My emPerform representative is responsive and helpful. Customer support exceeds my expectations every time! My representative is knowledgeable about their product and about how I use it. I also like the fact that I can give suggestions for functionality changes that would make my life as an administrator easier and emPerform is receptive to that feedback. I have even seen suggested changes rolled out during an update! One con is that some administrator reports require manipulation to be useful. Comments: emPerform offers attentive and efficient customer support. Their recent system upgrade is much more intuitive, modern, and user friendly and a great improvement to the system! Cons: When the appraisal is printed it's hard to read. All info runs together. There's no separation. Also, there needs to be a way to attach more than one document at a time. Comments: Great for organizations who have not had a system to support them with Performance Management. Pros: From the initial demonstration, we felt the system was very easy, almost intuitive to use. The company truly believes in their product and it shows in the way that they go to market. The emPerform tool is very flexible and easy to implement. Employee feedback has been positive! Pros: The flexibility - was able to accommodate our need to track/manage performance, without reviews or ratings at the end of the cycle. Cons: Some of the set up seemed complicated, but we had a knowledgeable implementation specialist to guide us! Thank you for your feedback Sherrie and we love hearing that your users are happy! Let us know if there is anything else we can do to help support your ongoing performance management efforts. Overall: emPerform's startup training is superb and the product is intuitive and easy to use. The recent upgrade has cleared up some issues that were confusing to some and improved the look and feel. The value proposition is also easy to accept. Good product. Comments: emPerform helps us to track and manage performance for many employees. It fits our needs and causes very few problems for us from a software perspective. Would recommend. Pros: The vendor is very responsive; the price is on the lower end of others we looked at. Cons: The software is not as flexible or intuitive as I would like; some managers think it's easier to write the review on a Word document and upload it to the system. Recommendations to other buyers: Understand your business requirements. If you need a flexible tool because your organization has different requirements within different departments, this tool may not work for you. If you have a one size fits all approach, this could be a good choice. Comments: emPerform is a very customizable system, allowing companies to set up the review process to best fit the needs of the company.